The recent visit of Russian President Vladimir Putin to Greece sent a clear signal to the EU that Russian has allies in the bloc, including Athens, one the closest of Moscow’s allies in Europe, a French analyst said. According to political and defense expert Guillaume Lagane, Athens now can "play the Russian card" in its relations with Brussels. Throughout history Greece has been close to Russia, in religious as well as geopolitical term, Lagan said. 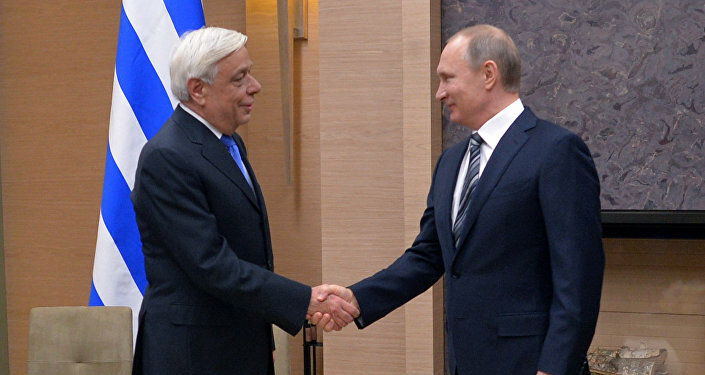 However, after Athens joined the EU and NATO, relations between Russia and Greece declined. But now a new kind of alliance is forging between the two countries, the analyst told Atlantico. "Greece cannot rely on financial aid from Russia. Due to the slump in oil prices and Western sanctions, there is a downturn in the Russian economy. Moscow will not replace the IMF for Athens. However with Greece, Russia may have a Trojan horse within the EU. This is why Moscow is not interested in grexit," he explained. At the same time, Lagane noted, Greece now is sending a message to EU officials that it has allies beyond the bloc. Furthermore, the expert described the Russian strategy of building ties and alliances in Europe, as he sees it. According to Lagane, there are countries in Europe which due to various reasons (historic, economic, or geopolitical) are ready to cooperate with Russia. As for Greece, they buy Russian gas and military equipment, in addition to common cultural and religious values. In addition to Greece, among those countries which are in good relations with Russia is Hungary, with Prime Minister Viktor Orban, a close Kremlin ally. There are also influential pro-Russian blocs in such countries as Slovakia and Italy. All of the above creates cracks in European "unity" against Russia, including the issue of sanctions, the analyst said.